When we see a large cat capturing its prey on the African savannah, we’re literally watching millions of years of evolution in action. But these attacks don’t always end in a meal, as “survival of the fittest” sometimes means the target gets to make a daring escape. New research uncovers the athleticism involved in these predator-prey encounters, and the best strategies for capturing prey—or avoiding being eaten. “The fastest and most maneuverable terrestrial animals are found in savannah habitats, where predators chase and capture running prey,” opens a new study published today in Nature. Without a doubt, these animals are the product of seemingly endless arms race, where each evolutionary adaptation is countered by another. But there’s a limit to these apparent advantages. If a predator gets too big or muscular, it may exhaust itself too quickly during the chase. Same goes for the prey. Evolution tends to favor an equilibrium point between predator and prey—a kind of “goldilocks zone” of physicality that constrains species in some specific and important ways. The new study, led by Alan Wilson from the U.K.’s Royal Veterinary College, explored a crucially important element of the predator-prey relationship: the level of athleticism required by animals to survive. Specifically, Wilson studied the biomechanics involved in two predator-prey relationships, namely the lion-zebra dyad and the cheetah-impala dyad. Lions and cheetahs were chosen as the predators of study because they typically hunt their prey in a one-on-one chase, while zebras and impalas represent the most common prey of each. These animals are locked in a Darwinian battle, shaping each other’s bodies over the millenia. Wilson sought to determine which physical characteristics and locomotion styles emerged in the predators to help them catch and take down their prey, and which characteristics evolved in prey to help them escape. To conduct the study, Wilson’s team developed specialized collars that were used to track the speed and acceleration of free-roaming animals. Five cheetahs, seven impala, nine lions and seven zebra were studied in their natural habitat in northern Botswana, Africa. An astounding 5,562 high-speed chases were recorded, each of them analyzed to assess the athletic capabilities of each animal (unfortunately, no collared animal engaged with another collared animal, which would’ve been cool data to have). The researchers also measured the muscle power of each species by studying biopsies taken from the animals’ hind-leg biceps muscle. “We are first people to measure those fine-scale dynamics of predator and prey and the muscle characteristics of the species,” Wilson told Gizmodo. In the new study, the researchers showed that both lions and cheetahs have evolved to become formidable athletes capable of making rapid starts and stops. Compared to their respective prey, lions and cheetahs have 20 percent higher muscle fibre power, 37 percent greater acceleration capacity, and 72 percent greater deceleration capacity. Those differences, which were remarkably consistent within each pairing, aren’t subtle; this study shows that predators, at least in the case of lions and cheetahs, have a huge physical, or “athletic,” advantage over their prey. But that’s not the whole story. Zebras and impalas may be less athletic, but they’re more maneuverable, which (perhaps counterintuitively) allows them to slip away at slower speeds. 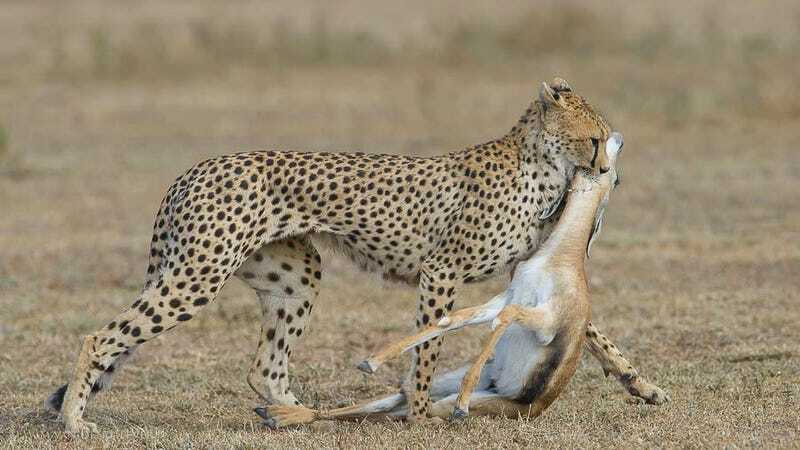 As the new study notes, the prey animal establishes the speed and route taken during the chase, but it’s the predator’s job to upset that strategy. Lions and cheetahs actually like it when their prey tries to beat them in a flat-out race. At full tilt, a prey’s movement becomes predictable—it can’t speed up any further, or make quick turns. Predators also tend to be faster than their prey. But if the prey animal runs slowly, it has more options, like twists and turns to make its movements less predictable. Incredibly, prey animals move at about half of their maximum capable speed during a chase. Predators, meanwhile, are always running faster than their prey, trying to close the gap. But when their prey makes an evasive maneuver, they have to slow down to follow the twists and turns of their target. Using computer models, the researchers confirmed that lower speed wasn’t a terrible disadvantage for prey, and that the best escape strategy is to turn at the last possible moment, taking a path the predator couldn’t possibly follow. Ironically, the faster the predator is going, the better it is for the prey—even if it’s caught. An exhausted predator may not be able to hold onto its prey. Why does a rabbit flash its white tail when its being chased? Still, it’s a fascinating line of research, one that helps us to better understand why these animals are built they way they are.